England were beaten 52-38 by New Zealand in Palmerston North as the two-match series finished level at 1-1. Having won the opening match 42-38 on Tuesday, England were bidding for their first series victory against the Kiwis. 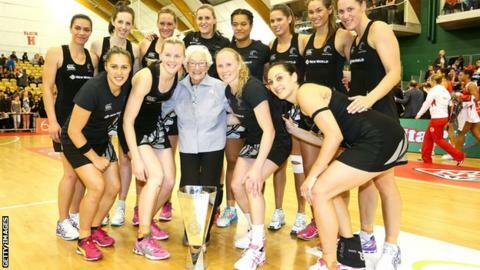 But the Silver Ferns, who had lost six successive matches, led throughout the contest and were 26-21 up at half-time. England cut the gap to two in the third quarter before the Kiwis surged clear to retain the Taini Jamison trophy, Cathrine Latu scoring 26 from 28. It was a disappointing finale for Anna Mayes's England side, who were beaten 2-0 by world and Commonwealth champions Australia earlier this month. They lost to New Zealand by just one goal at last summer's 2014 Commonwealth Games in Glasgow, their fifth consecutive semi-final defeat in the Games. Following England's victory by four goals in the opening match, New Zealand needed to win by five to retain the trophy and the match remained in the balance at 38-32 going into the final quarter. England's Rachel Dunn returned 16 goals from 16 attempts but passing options were restricted by a resolute New Zealand defence. New Zealand starting line up: Cathrine Latu, Jodi Brown, Grace Rasmussen, Laura Langman, Joline Henry, Katrina Grant, Temalisi Fakahokotau. England starting line up: Jo Harten, Rachel Dunn, Jade Clarke, Sara Bayman, Serena Guthrie, Eboni Beckford-Chambers, Geva Mentor.